“We went into the meet with two goals: qualify as many swims for state as possible, and beat (Madison) Memorial,” Middleton coach Danny Lynam said. “I normally just tell the guys to worry about swimming fast and not think about the score, but I could tell it would be good motivation for them after getting third at conference. Middleton senior Michael Draves was a star at sectionals, winning both the 200-yard freestyle and the 500-yard freestyle. Draves is now seeded third at state in the 200 and fourth in the 500. Sophomore Nate Lamers finished first in the 50-yard freestyle, while junior Archer Parkin was fourth. Lamers is seeded sixth at state and Parkin is seeded 13th. Lamers was also third in the 100-yard butterfly, while sophomore Nathan Kim was ninth and sophomore Forest Peterson was 10th. Lamers is now seeded third at state, while Kim is seeded 18th and Peterson is seeded 19th. 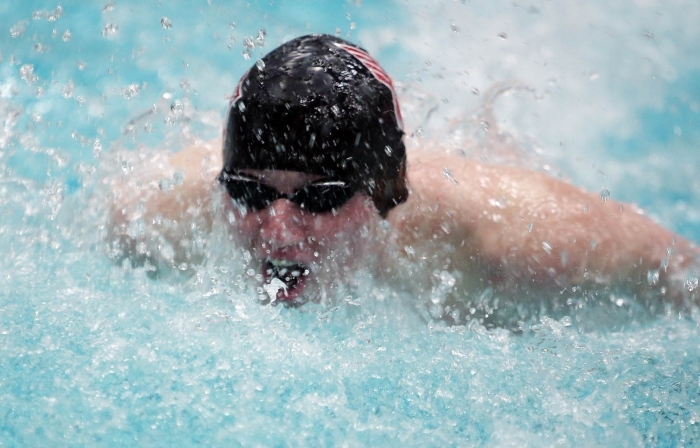 “Nate had a fantastic swim in the 50 (freestyle) at sectionals with a photo finish for first, and also put up a great race against Lain Weaver in the 100 butterfly,” Lynam said. “I know he is looking forward to racing him again (this) weekend. The podium could be in the future for both his events. “Nathan (Kim) had a disappointing finish to his season last year after fighting illness through sectionals. This year he has refocused and really honed in on the 200 IM and 100 butterfly. He is just starting to come around in both and we are expecting in big things from him (this) weekend. Junior Andrew Martin was second in the 500-yard freestyle and freshman Joe McNerney was fifth. Martin is seeded sixth at state, while McNerney is seeded 10th. Martin was also sixth in the 200-yard freestyle and McNerney was ninth. Martin is seeded 11th at state in the 200, while McNerney is seeded 21st. “Andrew has had a breakout year, and also continues to regularly drop time,” Lynam said. “Certainly he has a shot at the podium in the 500 freestyle, and the 200 isn't out of the question either. Senior Sam Young was second in the 200-yard IM and Kim was third. Young is seeded fifth at state and Kim is seeded seventh. Young was also second in the 100-yard breaststroke and is seeded fourth in that race. Junior Blake Zillner was third in the 100-yard freestyle and is seeded 12th. Parkin was fifth in the 100-yard backstroke, while Zillner was seventh. Parkin is seeded 10th at state and Zillner is 24th. “Blake is a perfect example of hard work paying off,” Lynam said. “His 100 freestyle will certainly contribute to team points, and after sneaking in his 100 backstroke as the last qualifier, he has nowhere to move but up. Middleton also had excellent showings in all three relay events. Middleton’s 400-yard freestyle relay team Zillner, Lamers, Martin and Draves was second at sectionals. That quartet is now seeded second at state. The Cardinals’ 200-yard freestyle relay team of Parkin, Lamers, Young and Draves was third at sectionals. That group is now seeded fourth at state. Middleton’s 200-yard medley relay team of Parkin, Young, Kim and junior Blake Zillner was fourth at sectionals and is seeded fourth at state. It all added up to a terrific performance at sectionals — and could lead to big things at state, as well.